The rest of the world is doing much worse than the U.S., with the China trade dispute, Brexit uncertainty and a weakening Japan. Economists are expecting 2.4 percent GDP growth in the U.S. this year, the highest forecast among G-7 countries where are mounting. "The U.S. economy has always been more self-contained than anybody else," says Scott Brown, Raymond James' chief economist. "The consumer really drives the bus in the U.S. and it's still a very positive story." Pedestrians carrying an American flag umbrella pass in front of the New York Stock Exchange. Things might look a little gloomy in the world's biggest economy, with slowing earnings growth and recession fears in the bond market, but stocks are still holding up just fine. That's probably because the rest of the world is doing much worse than the United States. With the unresolved trade dispute hurting China, which is already growing at its slowest pace since 1990, Brexit risk continually weighing on Europe and the U.K., and with new signs of weakness from Japan, the U.S. is standing out as the best game in town. "The U.S. economy has always been more self-contained than anybody else, compared to the major economies in Europe where trade is a much bigger part of the economy," said Scott Brown, Raymond James' chief economist. "The consumer really drives the bus in the U.S. and it's still a very positive story with job growth, wage increases and lower gasoline prices which adds to consumer purchasing power." Economists are expecting 2.4 percent GDP growth in the U.S. this year, the highest growth forecast among the Group of Seven countries where uncertainties continue to mount. "In general, we see the US equity market as the place to go to search for fast-growing companies," Peter Oppenheimer, Goldman Sachs' chief global equity strategist, said in a note Monday. U.S. stocks continue to outperform their international peers. 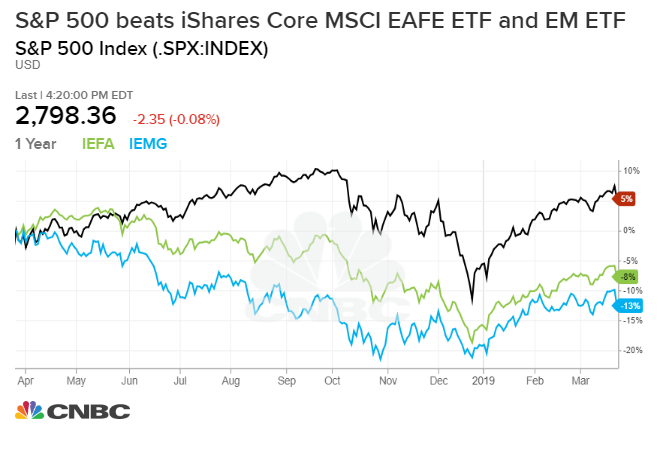 The S&P 500 has gained more than 11 percent in 2019, while the iShares Core MSCI EAFE ETF and iShares Core MSCI Emerging Markets ETF have posted only single-digit returns this year. Fitch Ratings "quite aggressively cut" its 2019 global forecast last week, citing a slowdown in China, Brexit and deceleration in emerging markets in the aftermath of the currency crises. Japan added to the heap of worries when the government downgraded its assessment of the economy for the first time in three years. The relative strength in the U.S. economy is helping sustain the rally in stocks after their epic rebound from a December bloodbath. Stocks were largely unfazed even after the Federal Reserve downgraded its economic forecast, reducing 2019 GDP outlook to 2.1 percent from a 2.3 percent forecast in December. "Now we see a situation where the European economy has slowed substantially and so has the Chinese economy, although the European economy more," Fed chair Jerome Powell said in a press conference Wednesday. Some also argued the U.S. still has more room to run in its record-long expansion. Fundstrat Global Advisors' Thomas Lee said key data including investment spending and employment ratio show the U.S. is in midcycle, rather than late cycle. Still, the slowdown in the U.S. is by no means subtle. The first-quarter earnings growth forecast for the S&P 500 companies has turned negative, a drastic cut from the greater than 3 percent growth seen in late December. However, the weakness follows a blockbuster year in 2018, when corporations reaped the benefits of the unprecedented tax cuts. "Remember this is coming after a very, very strong year of earnings growth, so you'd expect some pullback," Brown said. "People are still relatively optimistic given the amount of gains we had last year. A lot of it is coming from corporations cutting the bottom lines and still trying to hold line on cost rather than on the revenue side." Wall Street is still mostly bullish on stocks. The average S&P 500 target for 2019 from the 17 top analysts is 2,947, more than 100 points higher than current levels, a CNBC analysis shows. Credit Suisse raised its year-end forecast for the S&P 500 to 3,025 from 2,925, saying the "receding" risks will drive the market higher.